Abstract A full account of purposive action must appeal not only to propositional attitude states like beliefs, desires, and intentions, but also to motor representations, i.e., non-propositional states that are thought to represent, among other things, action outcomes as well as detailed kinematic features of bodily movements. This raises the puzzle of how it is that these two distinct types of state successfully coordinate. We examine this so-called “Interface Problem”. First, we clarify and expand on the nature and role of motor representations in explaining intentional action. Next, we characterize the respective functions of intentions and motor representations, the differences in representational format and content that these imply, and the interface challenge these differences in turn raise. We then evaluate Butterfill and Sinigaglia’s (2014) recent answer to this interface challenge, according to which intentions refer to action outcomes by way of demonstrative deference to motor representations. We present some worries for this proposal, arguing that, among other things, it implicitly presupposes a solution to the problem, and so cannot help to resolve it. Finally, we suggest that we may make some progress on this puzzle by positing a “content-preserving causal process” taking place between intentions and motor representations, and we offer a proposal for how this might work. Another useful presentation of their work is offered in “Intentions: The dynamic hierarchical model revisited”; link. I hope that it has become clear that a hybrid view of skilled bodily action where the intelligence of skill is cashed out in propositional, intentional terms and motor control is characterized in bottom-up, brute-causal, unintelligent ways is unsustainable. Instead of thinking of independent intentional states and automatic reflex-like basic actions or of independent action trajectories and the execution of those trajectories by processes of motor acuity, it seems that we must revise our view of skill in order to reflect findings which show that even those processes responsible for the automatic, low-level, fine-grained sensorimotor executions of motor skills are sensitive to high-level goals. My topic is the intelligent guidance of action. 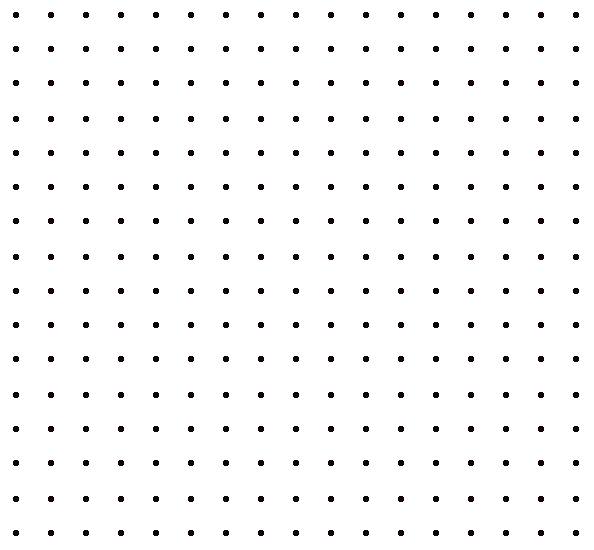 In this paper I offer an empirically grounded case for four ideas: that [a] cognitive processes of practical reasoning play a key role in the intelligent guidance of action, [b] these processes could not do so without significant enabling work done by both perception and the motor system, [c] the work done by perceptual and motor systems can be characterized as the generation of information (often conceptually structured information) specialized for action guidance, which in turn suggests that [d] the cognitive processes of practical reasoning that play a key role in the guidance of intelligent action are not the abstract, syllogistic ones philosophers often treat as the paradigm of practical reasoning. Rather, these cognitive processes are constrained by, and work well with, the specialized concepts outputted by perception and the feedback outputted by sensorimotor processes. One immediate thought that I had in listening to Elisabeth Pacherie present some of her work at a symposium in Bochum earlier this month is that this approach has the potential of solving the problem Norbert Elias was wrestling with in his own account of action. (Here is an earlier post on figurational sociology; link.) Elias used the example of skilled soccer play and proposed that we need to consider the unit to be the configuration (several players) rather than the individual player. But the real-time cognitive adaptiveness in skilled behavior described in this field of research provides a different and perhaps simpler way of understanding the rapid, intelligent adaptiveness of the players on the soccer field. Their bodily motions are indeed intelligent and adaptive, and their motions and reactions are responsive to the small clues available to them about the motions and intentions of the other players on the field. But at the other end of the research spectrum, it seems evident that research in this area is very relevant to work in robotics and artificial intelligence. Wendy Griswold addresses part of this viewpoint on sociological research in her very good overview of the field in Cultures and Societies in a Changing World. In order to answer these questions Young conducted several dozen interviews with young black men on the south side of Chicago, and his interpretation and analysis of the results is highly illuminating. Or take as another example the highly interesting work of sociologist Michele Lamont in Money, Morals, and Manners: The Culture of the French and the American Upper-Middle Class. Here Lamont studies the mentalities of high-status white men in the United States and France. Her question is a fairly simple one: how do these men formulate their judgments of success and failure in themselves and others? What features do they admire in others and which do they dislike? She conducts interviews with 160 men in four cities in France and the United States, and makes a sustained effort to discern the profiles of culture and value that she finds among these individuals. A key issue with this kind of inquiry is methodological. 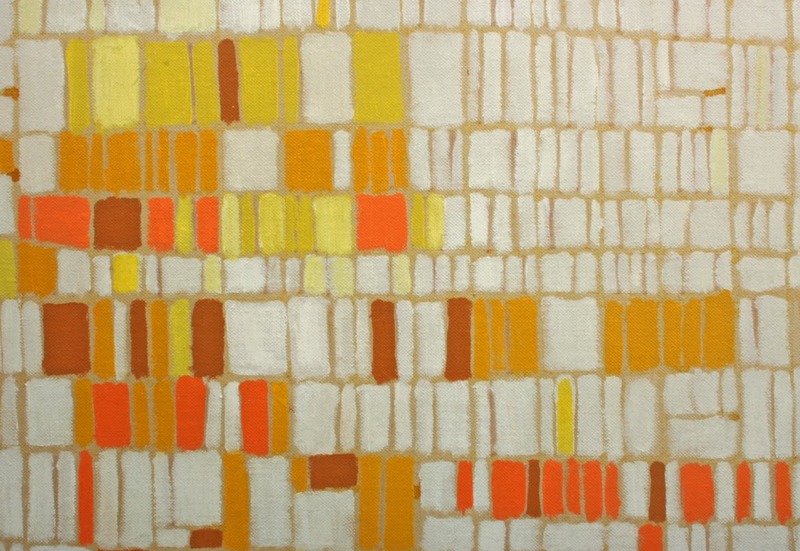 How should we investigate and observe the subjective characteristics of thought and feeling that this work entails? What are appropriate standards of validity on the basis of which to assess assertions in this area? Sociologists like Alford Young and Michele Lamont have often chosen a methodology that centers on open-ended unstructured interviews — very much the kind of thing that Studs Terkel was so good at. What these sociologists add to the approach of a Studs Terkel or an Ira Glass is an effort to analyze and generalize from the interviews they collect in order to arrive at mid-level statements about the mentality and symbolic frameworks of this group or that. And both Young and Lamont succeed in providing portraits of their subjects that are highly insightful and sociologically plausible — we can understand the mechanisms through which these frameworks take hold and we can see some of the meso-level consequences that follow from them in specific social settings. In a number of prior posts I’ve argued for an actor-centered sociology (link). And I’ve argued that we need to have better and more fully articulated theories of the actor if an actor-centered sociology is to be valuable. What I am calling cultural sociology here is one way for the discipline of sociology to get down to business in providing more nuanced theories of the actor. We often want the judgment of “experts” as we make important decisions in life, health, and business. But what exactly is an expert? One aspect of the idea is the possession of a large fund of specialized knowledge. A civil engineer specializing in bridge design is an expert in part because he or she has mastered the mathematics and physics describing the mechanics of large physical systems, the chemistry and properties of various materials, and the best practices that currently exist for ensuring safety. So the expert can be relied upon to have command of the most up-to-date and scientific specialized knowledge about a topic area. A second aspect of what we have in mind from an expert is a person who has had significant experience in acting and judging in a particular context (and who has refined his/her behavior according to the outcomes of those experiences). An experienced pilot has had the experience of landing an Airbus 330 at O’Hare Airport many times in many different weather conditions. As a result, he/she is ready to respond quickly to unusual wind conditions in a subsequent landing. Essentially this aspect of expertise comes down to trained behavioral skills and responses, permitting the expert to quickly adapt to somewhat unusual circumstances in the future. This is a combination of “muscle memory” and refined habit; it is the trained sensibility and physical awareness of an expert player. Another aspect of expertise is refined sensibility and perception. This is more akin to the trained palette of a wine connoisseur — a refined ability to discern the flavors and odors of a pinot noir that are perceived more generically by the occasional wine drinker. Here the idea is that there are aspects of the world around us that can only be perceived and discerned by a trained observer. Michael Polanyi describes this aspect of medical training in Personal Knowledge: Towards a Post-Critical Philosophy (link). A skilled physician has elements of all three kinds of expertise: the background fund of knowledge of physiology and disease that comes from medical training, the body of experience from which he/she has learned to judge and act, and a refined sensitivity to the minor indicators of disease that a non-expert would likely overlook. A skilled physician can diagnose an illness in a patient based on a body of symptoms, and he/she can prescribe a course of treatment that is likely to lead to alleviation of the disease or its symptoms. An experienced news reporter may have an unusual ability to “see” the story that underlies a few unusual activities by the city planning commission, and he/she may have a skilled ability to summarize the facts of a story in a logical and readable way. The former is a developed skill of reading a situation; the latter is a developed skill in presenting a sequence of statements in a logical way. Both of these abilities are skills the reporter has cultivated through prior experiences and the feedback that came from success and failure. Further, the reporter may be an expert concerning the facts of a story — he/she may understand real estate law, the business of real estate development, and the forms of collusion that are common in major development projects. The reason we seek out the advice of an expert in any of these senses when we are confronted with a high-stakes decision is that we think the expert has a better basis for understanding the problem we face and the options that are available to us, and a better basis for weighing the options. We think the expert can help us make the most reliable judgments and decisions in difficult cases. So appeal to an expert is a strategy for us to reach either knowledge or strategy that is better aligned with the world than our own intuitions and analysis would permit. As we consider the role of experts in helping us reach personal and collective decisions, it is important to keep track of the epistemic warrant of various kinds of expert judgments. 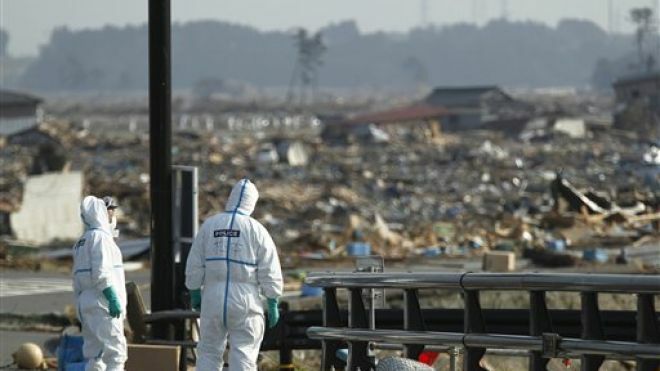 When we consider how best to respond to a nuclear power plant accident like Fukushima, we want nuclear engineers as experts who can advise the best short and medium-term remedies to the immediate hazards. But we might be more skeptical about the judgments of these same experts when it comes to assessing the long-term viability of nuclear power. The assumptions on the basis of which the expert offers the latter kind of judgment may actually be very shaky, whereas the knowledge of nuclear design and physics that is the basis of the former kind of judgment is very strong. 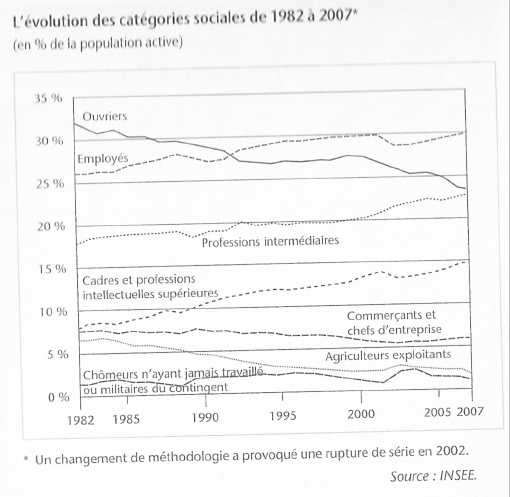 There is a place within the sociology of science and the sociology of science for study of “expertise”, and some sociologists like Marion Fourcade have turned their attention in this direction. Expertise can be viewed as a kind of social capital, on the basis of which the expert and those who employ his/her services are able to gain various kinds of advantages. 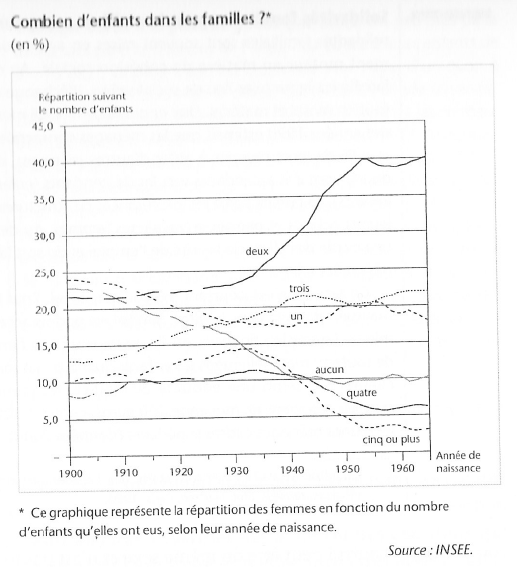 Fourcade’s Economists and Societies: Discipline and Profession in the United States, Britain, and France, 1890s to 1990s is not specifically focused on the social composition of expertise, but it offers a good example of how the question might be pursued. Social scientists have a set of abstract goals in approaching their work. They want to formulate specific research questions about limited aspects of the social world and then arrive at empirical and explanatory insights into those matters. They look for the evidence of social structures and systems, regularities of social behavior in populations and groups, and so on. They are looking to provide abstract, general knowledge about how society works. They would like to arrive at clear “diagrams” of the social structures and mechanisms that constitute the contemporary social world. But think about the challenge of understanding society from the other end of the stick — the perspective of the ordinary participant. 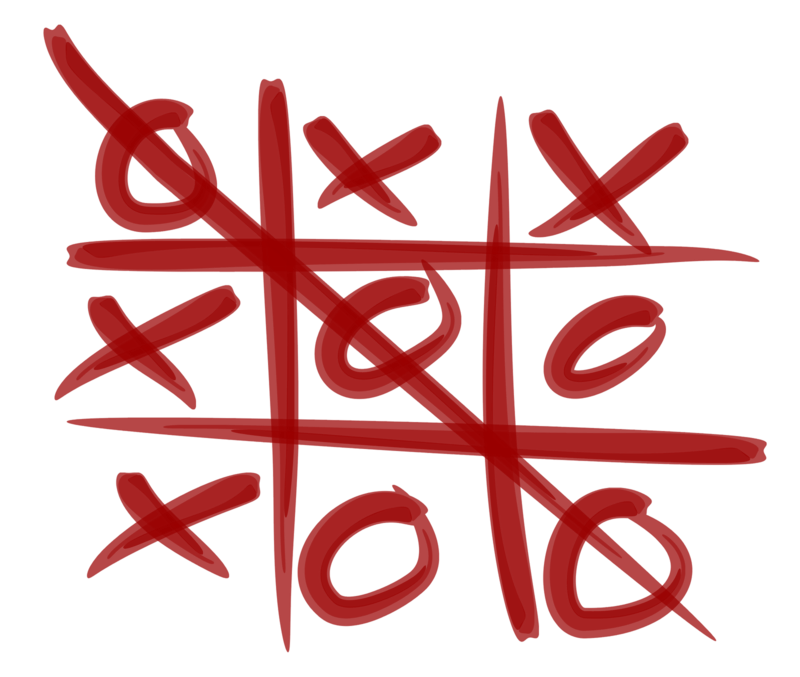 From the participant’s perspective the situation often looks more like an environment of black boxes: how will the world respond if I do X, Y, or Z? And for a significant part of society, how the boxes work is a life-affecting mystery. There is a significant proportion of almost any society for whom these kinds of questions can be answered with a satisfying routine: if I go to work today I can count on getting a day’s pay; my pay will permit me to satisfy my ordinary needs reasonably well; and tomorrow will be equally routine. The police won’t hassle me, my home won’t be broken into, my health is good, and my children’s school situation is good. So there isn’t much at stake for this group of people as they consider how the social world around them works. What about people for whom life is not routine and comfortable, however? Put yourself in the position of an African-American high-school-educated worker who has just lost his job in Taylor, Michigan. Suppose you’ve got an apartment for your family of five that costs $750/month. You’ve got an old car that breaks down frequently. While you’ve been working your family has just barely scraped by. Now that you’ve lost your job things are no longer routine. Unemployment insurance brings in less than 60% of the wages you’d been making. That’s not enough to cover all the bills you’ve got — rent, food, clothes for the children, gas for the clunker, a few medical bills. So what choices does the environment offer now? The largest part of the family budget is the apartment. So maybe moving out early is a good choice — find something even cheaper, live in a shelter for a few months, live in the clunker. These are desperate choices — being homeless is desperate, and it’s hard to find an apartment for less than $500. Also, the landlord will probably want first and last month rent deposit as well as proof of employment, and you haven’t got that. So maybe it’s the shelter or the car. Looking for a new job is an obvious choice. But the unemployment rate in Wayne County is much higher than the rest of the state and the nation. So that’s iffy. How about borrowing? Like many of your friends and family, you don’t have a credit card and you don’t have assets that could be the basis for borrowing. There’s nothing in the house that can be sold. And you’ve got about $1000 in cash. So what to do? Your landlord won’t be patient after a few months of missed rent checks. Maybe looking for work outside of Wayne County will occur to you. Maybe there are jobs in Texas. But how would you find out? Would you use part of the thousand dollars and take a bus to Houston where you have a cousin, or to Dallas where you don’t know anyone? That leaves about $800 for your family to survive on while you’re gone — is that a good risk? And how likely is it that you’ll find work in Texas that will permit you to send enough money back home to make the difference? Or maybe another part of Michigan might have more jobs. Not Flint, that’s for sure. But what about Grand Rapids? 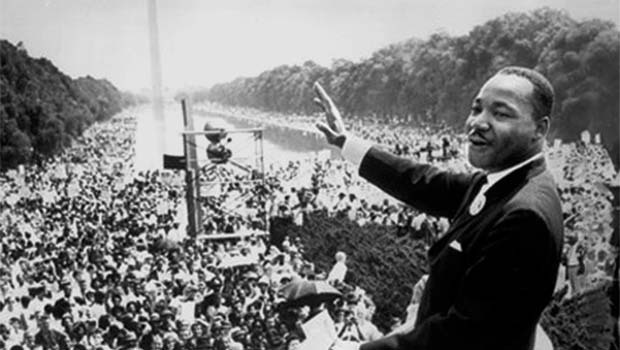 Now the question of race comes into the picture. How receptive is Grand Rapids to an unemployed black man looking for work? How will the police treat you when you arrive in the bus station? Are there social services that might help out till you found work? How would you know? Have you got any friends in GR who might be able to get you started? You might be very well aware that a lack of education is holding you back. So maybe you can get some training at a community college to boost your job skills — welding or health tech, perhaps. But that takes time, and you’ve only got a thousand dollars and an unemployment check. That would have been a good idea a while ago, but it’s hard to see how to make it work now. And what about the criminal options? 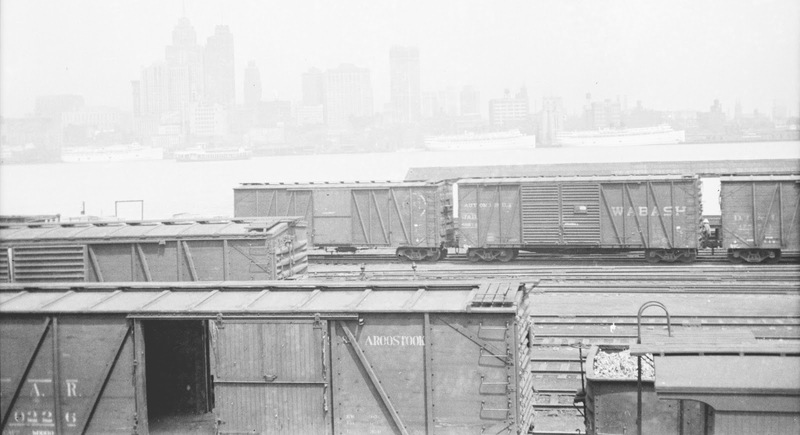 Maybe you know some guys who sometimes break into stopped rail cars in Detroit. Once in a while they find stuff that can be sold. Does that make sense? What’s the likelihood of being caught? Is there money in this kind of racket? How would you sort that out? My point in this thought experiment is to draw out how different the “social epistemics” are for the marginalized 30-40% in our society from the rest of us. The routine relationships they have with the social world around them don’t satisfy their most basic needs. They’ve got to do something different. And none of the options are obvious in their mechanics or outcomes. There are uncertainties everywhere, and every choice is a bet against disaster. This is a very personal kind of social calculation: it requires figuring out which play may push destitution off for a few weeks or months. And yet in one sense they’re dealing with the same realities as the social scientist: large institutions (labor market, state social service agencies), informal social practices and networks (networks of people willing to share what they’ve got, networks of people preying on the formal economy), large social realities like racism and police violence. One of the things I appreciate in Walter Mosley’s Easy Rawlins novels is the care Mosley takes to work out the ordinary street knowledge that Easy needed — and mastered — as he survived and thrived in the gritty world of Los Angeles in the fifties and sixties. Easy had a very strong street epistemology, not as a sociologist but as an intelligent observer of a complicate set of social black boxes. Here is one good example, A Little Yellow Dog : Featuring an Original Easy Rawlins Short Story “Gray-Eyed Death”. There is a lot of interesting stuff we encounter every day, if we stop to think. Often we don’t have the knowledge necessary to make sense of it, so it remains interesting but opaque. And plainly each vignette has a dense set of social facts standing behind it that need to be teased out if we are to understand the vignette. Here is an example. I’m in Toronto this morning and I’ve seen something here I haven’t seen in other cities — young people, mostly men, sleeping on the sidewalk at busy intersections. They look comfortable in down sleeping bags — as if they were camping out. But they aren’t camping; they’re sleeping in full daylight, with pedestrians and drivers passing in the hundreds every hour. 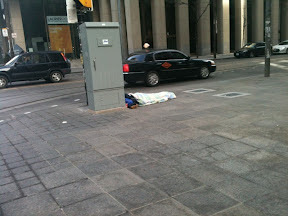 Here is a specific guy sleeping on Bay St Sunday morning. He looks to be in his twenties, lightly bearded. And, by the way, he’s got a plastic St Patricks Day hat near his head. As pedestrians walk by they take a curious look and then pass on. No one stops. It doesn’t look like a safe place to sleep — cars are passing in the street on the turn from Queen St, and just a slight mistake takes them onto the curb and onto the guy. Now here’s an interesting development — a real homeless guy, over sixty, heavily bearded, dressed warmly, happens by. He takes a close look, then walks around the sleeping guy to check him out; stands and thinks for a minute, then moves on. Why are they here? There was an Occupy Toronto demonstration in City Hall Park nearby yesterday — is this young guy an Occupy protester? The Old City Hall and green space is just across Queen St. Why hasn’t this guy chosen to locate himself on the grass somewhere more secluded? Perhaps because the police would make him move on; perhaps because more secluded space is also more vulnerable space. And why not in a city shelter? They exist, so why has this young guy chosen the street? But here is another interesting point to me: I’m observing this scene without any special background knowledge. What would a social worker, a street activist, or a policeman see that I don’t notice in this scene? The policeman might quickly have registered the fact that the green spaces across Queen St aren’t actually that attractive for sleeping because the police patrol them and evict sleepers. The activist might notice some features of the guy allowing her to identify the political statement he might be making. The social worker would have a much clearer idea about the shelter system. But now I get a chance for a little clarity. 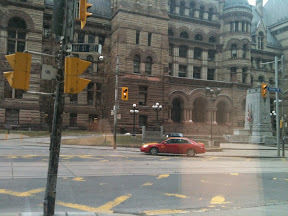 A block away I encounter two young guys (20s) sitting on the street, right at the curb, panhandling on Queen St. They greet me. I stop and talk to them. I ask why the guy down the street is sleeping right there on the sidewalk. G1 said that he sleeps there too sometimes. I asked why not in the park. He says because Mayor Ford has ordered that people be ticketed for sleeping in the park. He himself has been banned from City Hall grounds because of panhandling. And if you go near the Marriott entrance just down the block, Marriott security make you move. I asked why they don’t choose more secluded spots. G2 says you need to sleep near a vent for the warmth. The good secluded spots are taken. Sometimes these two guys find a spot under a structure down the street. I ask about Occupy Toronto. G1 is enthusiastic. He says he was welcomed into the biggest tent, the Communist tent, and slept there while Occupy was going on. It was a 12-person tent. But the guys say the demonstration that I heard yesterday wasn’t Occupy, it was a demo about Syria. G1 says, why demonstrate against Syria when people here are suffering? 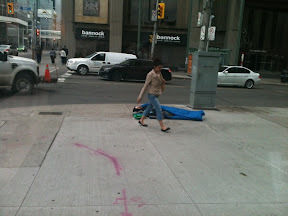 I ask if it is safe sleeping on the street. G1 says he’d been robbed recently. The thief ripped his inside pocket out and took a bag with 35 cents, a tooth brush and toothpaste. G1 says indignantly, “You’re going to rob a man for his toothpaste?” They say people have been killed down the street a ways. I ask about the city shelters. Neither of them wanted to go there: they refer to bedbugs, diseases, and seriously crazy people who might hurt you. G1 gives me some advice about street people. He holds out his jacket, which is clean and in good shape aside from the ripped-out inner pocket. He says, when you see a guy who’s all dirty, bad clothes, bad teeth, that’s a crack-head. Whatever you give him he’ll just turn around and buy crack. He then grins to show me his teeth, all in good condition. Both guys are friendly and very willing to talk. (Is there a personality type that does best as a panhandler? Are the same attributes of gregariousness that work well in business also good in this part of the street?) I liked these young guys, and it’s painful to know that there’s nothing for them in Toronto or in their futures. Toronto people — what am I missing here? How do you understand this scene? Harold Garfinkel made highly original contributions to the field of micro-sociology in the form of his program of ethnomethodology, and the fruits of these contributions have not been fully developed. His death a few weeks ago (link) has led quite a few people to look back and re-assess the importance of his contributions. This renewed attention is very much warranted. Studies in Ethnomethodology (1967) is the primary place where his ideas reached a broad public, so let’s take a look at some of the ideas advanced there. A central empirical interest of Garfinkel’s is the nuance of the ordinary knowledge — commonsense knowledge — that people use to navigate their daily lives and tasks. What presuppositions about actions and motives do jurors rely on as they reach judgments about truth and falsity of testimony? What ellipses occur in ordinary conversations that are nonetheless intelligible to the participants because of unspoken background knowledge? What implicit beliefs and standards do coders for the Los Angeles Suicide Prevention Center use to classify unexpected deaths (11 ff.)? The way that I would like to paraphrase Garfinkel’s work is that he is offering an empirical research program designed to fill in a rich theory of the human actor’s “competence” in engaging in ordinary social interactions. What does the actor need to know about immediate social relationships and practices in order to get along in ordinary social life? And how can we study this question in empirically rigorous ways? The program of ethnomethodology is intended to focus attention on the knowledge of rules and practices that ordinary people employ to make sense of their social surroundings. One objection that some purists might offer of this formulation is that it puts the object of investigation “inside the head,” rather than in the behavioral performances — primarily conversations and classificatory tasks — that Garfinkel primarily studies. It is thought that Garfinkel’s method is formal rather than mentalistic. It is true that he says repeatedly that he is not interested in getting inside the head of the individuals he studies. But the logic of his findings still has important implications for the cognitive systems of the individuals, and this is in fact the only reason we would be interested in the research. So I want to understand his research along the lines of a Chomskian linguist: making inferences about psychologically real “competences and capacities” on the basis of analysis of non-mental performances (utterances). On this approach, Garfinkel did not pretend to offer a full theory of agency or actor consciousness; instead, his work functioned as a sort of specialized investigation of one aspect of social cognition — the competences, rules, and practices we can attribute to specific actors on the basis of careful analysis of their observable performances. There isn’t very much transparency about the deep structure of almost any complex modern society. For most people their primary impressions of the society’s functioning comes from the mass media and their own personal experiences. We each see the limited bits to which we are fairly directly exposed through our ordinary lives — the newsroom if we happen to be a beat reporter, the university if we are professors, the play-and-learn center if we are in the business of preschool education. We gain a pretty good idea of how those networks of institutions and organizations work. But it’s very difficult to gain a birds-eye picture of the social system as a whole. The most basic goal of Marx’s economic programme was to demystify the workings of the political economy of capitalism. He wanted to sweep aside the appearances that capitalism presents and to lay bare the underlying social relations of inequality and exploitation that really constituted the causal core of the system. (This is the point of his theory of the fetishism of commodities; link.) And he believed that active systems of ideology and false consciousness conspired to conceal these workings from ordinary participants. In particular, he wanted to demonstrate the process through which wealth is created within capitalism, and the relations of inequality through which its benefits are distributed. It is a class-based analysis, and Marx proposes to the proletariat (and the rest of us) that we look for the class mechanisms of our ordinary economic experiences. What is unsatisfying about Marx’s theory in the current context is that in the end it isn’t really very much of an empirical demonstration. It is an abstract model of how the theorist thinks capitalism works, rather than a detailed empirical exposure based on rigorous and diverse data that demonstrates the flows that he postulates. It offers a schema for connecting the dots of our ordinary experience, but it doesn’t actually carry out the effort. Other researchers have done so, of course; researchers who demonstrate the widening inequalities of income and wealth that market democracies contain, the consequences of these inequalities for people at both ends of the divide, the often degrading conditions of work that the majority of the working population experience, and so forth. So on the dimension of wealth, income, and privilege, it isn’t too difficult to gather the information we need to better understand our current economic realities based on information that is readily available; but most Americans don’t seem to bother to do so. The ease with which the right has succeeded in setting the terms of popular ideas about organized labor, racial inequalities, and immigration bears that out. Lies and slogans replace honest factual argument. And what about the other large determinant of outcomes in modern society, the workings of political power? Here too there are founding theorists who sought to lay bare the “real” workings of power in a market democracy. Foucault is one; Domhoff and Mills sought to do so a generation earlier. The goals of C. Wright Mills (The Power Elite ; link) and G. William Domhoff (Who Rules America? Challenges to Corporate and Class Dominance ; link) were similar to Marx’s, but in the sphere of political power within a democracy. They wanted to demonstrate how the language of pluralism and representative democracy works to conceal a system of power and influence that was anything but egalitarian. They wanted to shred the ideologies and obscurantist narratives that conceal these political realities. But, like Marx to some extent, their writings too remained schematic. They offered a framework for thinking about political power that was radically different from that of the pluralists. But they didn’t really provide a detailed empirical exposure of the workings of this system in real time. 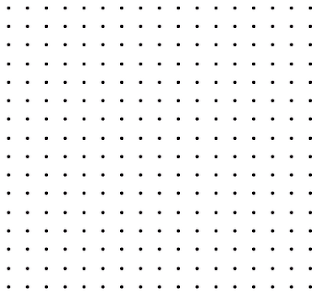 So here again, we’d like to have an organized way of connecting the dots within the contemporary world. How do corporations use lobbying firms and campaign PACs to shape policy and legislation to their liking? How is it going on today? And, as is the case of the domain of economic inequalities, there are plenty of sources today shedding light on aspects of these processes. But these political realities seem if anything, even more difficult to perceive. The blog Naked Capitalism approximates the kind of dot-connecting that I’m describing, with specific application to the financial industry. Here a group of very expert observers are taking the trouble to track the complexities and the hidden interests involved in the financial industry, and to try to make sense of what they find in an honest way. I. F. Stone was a one-man dot-connector in the 1960s when it came to the Indochina War (Best of I. F. Stone ). The opening chapter of Frances Fox Piven’s Challenging Authority: How Ordinary People Change America does a good job of sketching out the influence systems that set the planets in motion in American democracy. And Bob Herbert’s last column for the New York Times does it as well (link). We need exactly these kinds of effort in other areas too — defense contracting, influence peddling, the pharmaceutical industry, news media, … We need help connecting the dots of how our society works, who pulls the strings and who benefits. Blogging, critical journalism, and crusading thinkers like I. F. Stone and Frances Fox Piven can help a lot. And, by the way, it must be done in a way that is committed to high standards of empirical fidelity; it needs to inspire the kind of trust that Stone was able to do fifty years ago. And maybe, with the makings of a more truthful shared understanding of how our society actually works, we will succeed in creating a politics that transforms it. Louis Maurin recently published a valuable book on contemporary French society, Déchiffrer la société française, which is intended to shed light on the social realities of France in a way that is genuinely accessible to the public. There are chapters on population, the family, schooling, immigration, unemployment, consumption, and social values, among other important topics (link). The book is intended to capture and encapsulate some of the data that is available through French sources that will make the basic outlines of France more transparent to the public. (There is a companion website for the book as well.) Denis Clerc provides the preface for the book — another voice in French society calling for greater transparency about inequalities. Each topic is a fundamental one — population, nuptiality, family, schooling, immigration, employment, consumption. And the data that Maurin summarizes are often striking and unexpected. 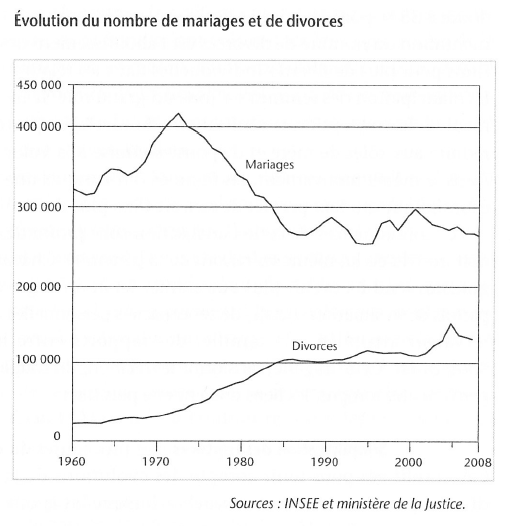 Here is a striking graph of the absolute number of marriages and divorces since 1960, and a graph of family size changes between 1900 and 1970. The marriage rate increased sharply in the 1960s into the early 70s; it then went into a steep decline. 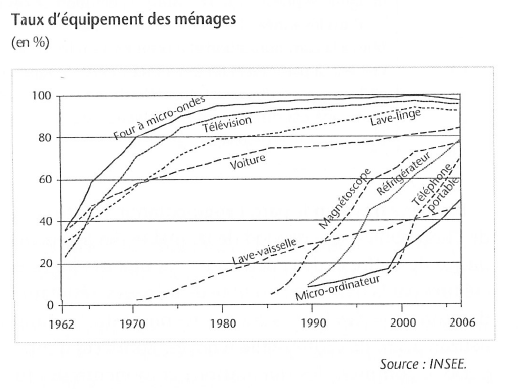 Here are several graphs representing economic and social changes in the past thirty years. 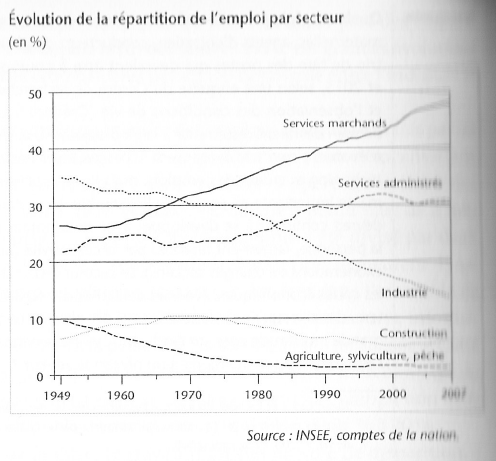 The first tracks the percentage of adults in different socio-economic groups: workers, managers, professionals, executives, farmers, and permanently unemployed. The second tracks the fairly steep decline in the number of hours worked annually by a worker, from under 2000 to under 1500. The third tracks the shifting composition of the workforce, documenting a dramatic decline in industrial labor from 35% to 15%. 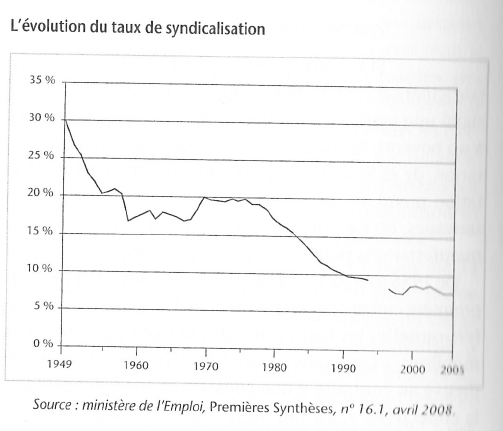 And the fourth graph tracks union membership, from a high of 30% in 1949 to a low of 8% in 2005. 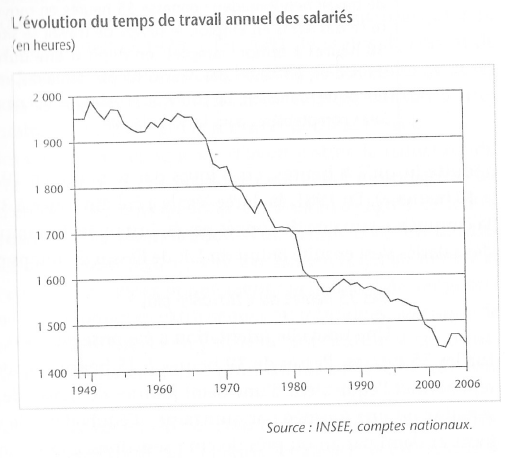 This is surprising for Americans who think of the French workforce as being highly unionized. And what about education? Maurin draws attention to the progress of the bac over the past 60 years. 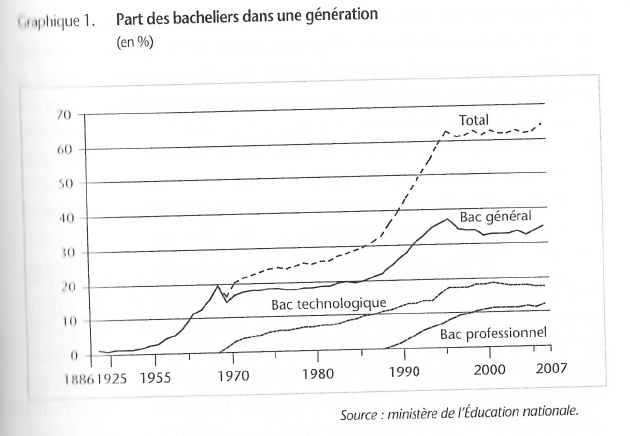 The creation of the bac technologique and the bac professionnel in 1968 and 1988 respectively conjoined with growth in the bac general to produce rapid increase from the mid 1980s through 1990s; and the total has remained flat since the 1990s. In short — French society is as complicated as any other, with its own history and current social forces. And many of the social realities the French currently face are obscure in their causes and their distribution across regions and classes. So it is particularly important for authors like Maurin to help pull back the curtain from some of these basic social facts.